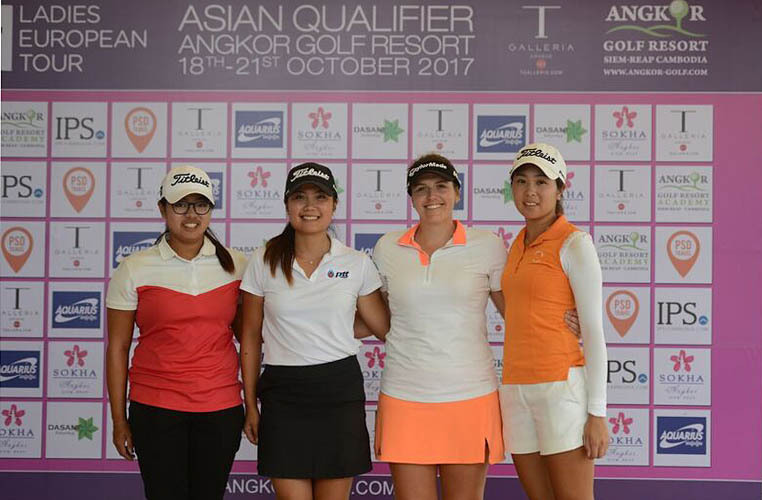 Amanda Tan, Jackie Chulya, Paige Stubbs and Ayaka Nakayama have qualified for the Final Stage of Lalla Aicha Tour School in Marrakech, Morocco. Players from seven different countries attended this year’s Lalla Aicha Tour School Pre-Qualifier in Cambodia competing for four spots to the Final Stage in Morocco. The standard was set early in the week by Amanda Tan (Singapore) who had a hole-in-one on hole 17 during her final practice round and her form continued into round one where she opened with a 4-under par 68 to hold a three-shot lead from Australian, Paige Stubbs. As the rounds progressed there was visible stress and nerves on the fairways. Singaporean, Tan, had played very solid in rounds two and three, adding a 72 (level) and 70 (-2) to her opening 68, moving her to 6-under after 54 holes, holding a 4-shot lead from Jackie Chulya (Thailand). In her first event as a professional it was the Thai player, Jackie Chulya, who clinched top spot in Siem Reap with an impressive final round 68 (-4), matching the low round for the week, to win the $1000 prize, and a place in the Final Stage of Q-School, by one shot. After a tense finish, Ayaka Nakayama (Japan) and Paige Stubbs (Australia) took third and fourth positions, both finishing on 293, +5 for the week. “It has been great working with the LET for a second year to deliver a very successful Event here at Angkor Golf Resort. Even more rewarding is talking with the players and their family, listening to their fantastic feedback on all thing Angkor Golf Resort and visiting Cambodia,” said Alan Martin, Head Professional at Angkor Golf Resort. Designed by European legend, Sir Nick Faldo, the award-winning par 72, 7,279-yard championship golf course yet again proved its place as one of Asia’s top venues, conveniently located five minutes from Siem Reap International Airport and 10 minutes from the famous Angkor Wat temple. Cambodia has a budding golf tourism market and this event provides a great showcase of the world class facilities at Angkor Golf Resort, which has received a huge raft of accolades since opening in 2008.